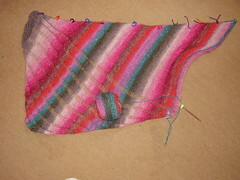 This is coming along really fast and your wool choice is so lovely. On Ravelry, it's listed as Clapotis and it's a free pattern from Knitty in 2004. The yarn I'm using is Noro (the first Noro I've ever bought) so it's self-patterning and lovely.